Gingerbread may have been invented by the ancient Greeks, but it has evolved over time and place. 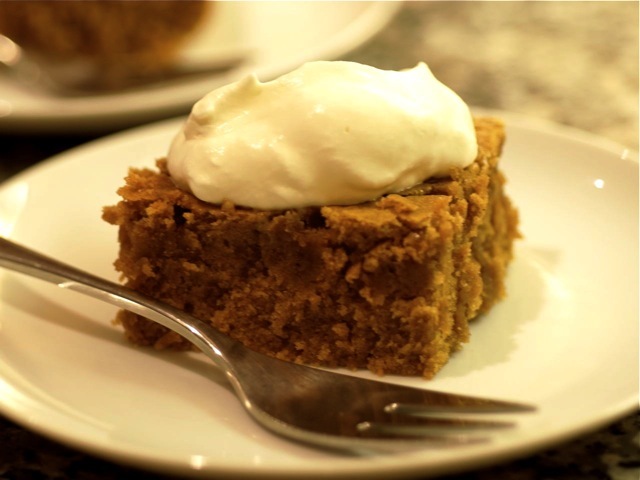 The earliest settlers to the New World enjoyed gingerbread often; the first recipe appeared in Amelia Simmons' American Cookery in 1796. This dark, spiced cake is lovely served plain or accompanied by whipped cream, lemon curd, or applesauce. Sift the flour, cinnamon, baking soda, ginger, salt, and cloves into a medium bowl. Set aside. Beat the butter and brown sugar with an electric mixer in a large bowl until light and fluffy, about 3 minutes. Add the eggs, one at a time, beating well after each addition. Add the lemon zest and molasses and beat to combine. With the mixer on low speed, alternately add the flour mixture and milk to the bowl in 3 additions, beginning and ending with the flour. Pour into the prepared pan. Bake for 40 to 45 minutes or until a toothpick inserted into the center comes out clean. Cool the cake on a wire rack. Serve warm or cooled.